Connect Sumo Logic to your Slack channels and get tailored alerts to the right teams. Power your alerts with flexible search options and connect via Webhooks. Set up any number of Webhook connections to suit your team’s needs. Base your alerts on scheduled searches or create brand-new searches to send to your Slack channels. 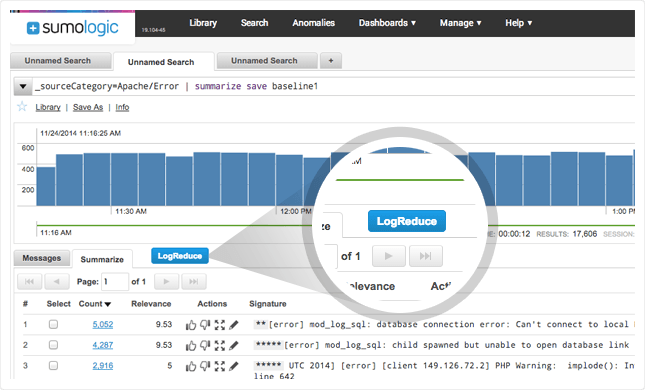 Sophisticated log analysis powers your automated error alerts through Slack. The Slack platform empowers teams to have smarter, more efficient communication through targeted channels, direct messaging, and calls. By connecting Sumo Logic information to a Slack channel via webhooks, users can send log data to the just right places and avoid the information overload of other communication platforms. Sumo Logic integrates with Slack, allowing the ability to send automatic Slack alerts as a post to a Slack channel. Driven by Sumo Logic’s powerful search features, integration with Slack is a great way to make sure error messages are getting to the right places at the right time. In the Sumo Logic platform, you can easily configure HTTP endpoints that tell Sumo Logic where to send data, otherwise known as a Webhook connection. Sumo Logic puts no limits on the number of Webhooks you can create, so the number of connections you create is up to you and your organization's needs. Scheduled searches are saved searches that run automatically at specified intervals and tell Slack what data to pull in. When a scheduled search is configured to send an alert, it can be sent to another tool (like Slack) via a Webhook connection. You can create a brand-new search, or you can base a search on an existing saved or scheduled search. If you'd like to use an existing search, you'll need to save the query as a new search to not override the search's current schedule. The payload for each scheduled search can be customized (depending on the tool you're connecting to). Customizing payload does not affect the payload you defined in the Connection; rather the payload is at the search level. View the demo video to learn more about how Sumo Logic alerts allow you to monitor metrics in real-time and send notifications to a designated Slack channel.